After writing a couple of “serious” articles on building authentication systems with Rails, I decided to have a break and play some games. I just Googled for online games and stumbled upon Dota 2. Dota 2 is an immensely popular (more than 10,000,000 unique players last month) battle arena game developed by Valve. The game is quite complex and some web services like DotaBuff were created to help players track their progress. After visiting DotaBuff and seeing all of its beautiful tables and graphs, I just couldn’t stop myself from searching for information about the Dota 2 API. The Ruby thing to do is to share my research with you! In this article, we are going to work with Dota 2 API. We’ll create an app that borrows basic functionality from DotaBuff: a user logs in via Steam and sees a list of his recent matches and statistics. I’ll pinpoint all the gotchas I faced during development of this app and give some advice on how this can be implemented in production. Working demo can be found at sitepoint-dota.herokuapp.com. According to Wikipedia, Dota 2 is a free-to-play multiplayer online battle arena video game. It is the stand-alone sequel to the Defense of the Ancients modification for Warcraft III: The Frozen Throne. Its mechanics are quite complex, so I will just give you a quick overview. Originally, DotA (Defense of the Ancients) was a custom map for Warcraft III developed by a person called IceFrog. 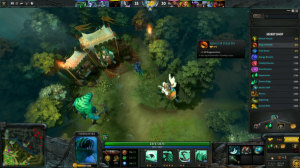 After a couple of years, it became so popular that Valve decided to hire IceFrog and create a standalone version of the game, which they called it Dota 2. It was released in 2013 and now is considered one of the most popular online games in the world. Many professional competitions with money prizes are being held and streams by experienced players are being watched by hundreds of people. Talking about gameplay, there are two teams (Radiant, good, and Dire, evil) with (typically) 5 players each. At the start of the game, each player picks one hero from a pool containing more than 100 heroes and enters the game. Each team has their base and the ultimate goal is to destroy the main building on the enemy’s base while protecting your own. Players can buy various artifacts (each hero may take up to 6 items at once), kill creeps (creatures, controlled by AI) or enemy heroes to earn gold and experience. Each hero has unique set of abilities that players use to help their teammates or wreck havoc upon enemies. That’s Dota in a nutshell. Let’s proceed and see what goodies the Dota 2 API present. I will use Rails 4.2.1 throughout this article, but the same solution can be implemented with Rails 3. Great, preparations are done and we can move forward! Okay, where is this key? Visit this page (you will need Steam account to proceed) and simply register a new key. Among all web platforms supporting OAuth, Steam provides the fastest way to register your application. uid (string, index, unique) – User’s unique identifier. nickname (string) – User’s nickname (Steam also provides name). avatar_url (string) – Link to user’s avatar. By the way, we can’t choose avatar size. profile_url (string) – User’s profile URL on Steam. The first one is the callback route where the user will be redirected after a successful authentication. I had to use match here because, for some reason, Steam seems to be sending a POST request instead of a GET (that’s what most other platforms do). The second route will be used to log the user out. flash[:error] = "Can't authorize you..."
That skip_before_filter is another gotcha with authentication via Steam. It sends a POST request, but of course it does not provide the CSRF token. Therefore, by default, you will get an error saying that someone is trying to potentially sending malicious data. As such, we have to skip this check for the create action. The create action itself is simple. Fetch the user’s data stored inside request.env['omniauth.auth'] and create a new user or find an existing one based on said data (we’ll introduce the from_omniauth method in a moment). If everything is okay, store the user’s id inside the session, set the welcome message, and redirect to the main page. Find a user by his uID or create a new one and then simply fetch all the necessary data. But what is that 76561197960265728 number? This is the third gotcha. While authenticating via Steam, the user’s 64-bit uID will be returned. However, when listing Dota 2 matches, the user’s 32-bit ids are used, instead. There is surely a reason for that, but I wasn’t able to find any explanation. Anyway, we have to convert the 64-bit id to 32-bit and the easiest way to do that is to subtract this large number. Don’t worry, Ruby takes care of BigInt numbers for us transparently, so you don’t have to perform any additional actions. The helper_method ensures that this method can be called from the views, as well. You may now restart the server and see this all in action! At the time of writing I had to specify the master branch, because recently we have revealed that some changes were made to Dota 2 API and they are accounted for in the latest pull request, however a new version of the gem is not released yet. By the way, I wanted to warn you that some aspects of Dota 2 API may change from time to time and you should watch out for it. Put the Steam key that you’ve obtained earlier in this file. Basically, that’s it. You are now ready to perform API requests. I want to get the list of user matches as soon as they authenticate via Steam. However, before we proceed, I wanted to point out one thing. The solution described in this article is implemented for demonstration purposes only. If you want to build a real world application similar to DotaBuff, you will have to implement a more complex system with some background process that constantly checks if there are any new matches played by the specific user (or even if there are any new matches at all) and loads the corresponding data. Then when a user logs in, you simply provide a list of all matches from you local database, not by sending a synchronous call to the Dota 2 API. Loading information for even 40 matches can take up to 1 minute – and users typically have hundreds of them. It will require loads of storing capacity (just imagine how many matches are being played every day) and obviously I can’t afford to set up such an environment. However, when you do have fair amount of data, you can display really interesting statistical information like what is provided by DotaBuff. uid (string, index) – Unique identifier of the match. winner (string) – Which team won the match. Actually, this will either be “Radiant” or “Dire”. first_blood (string) – When first blood (first hero kill) occurred. Dota 2 API returns a number of seconds since the match started, but we’ll store a formatted value instead. Feel free to make this column integer and store the raw value instead. started_at (datetime) – When the match was started. mode (string) – Match mode. Here is the list of all available modes. We are going to store the title of it, but you may also store its ID (Dota 2 API provides both). match_type (string) – Type of the match. Here is the list of all available types. Again, you can either store its title or id. Don’t call this column type because it is reserved for single table inheritance! duration (string) – Duration of the match. Again, API provides a number of seconds, but we’ll store a formatted value. user_id (integer, index) – Foreign key to establish one-to-many relation between matches and users. First of all, load matches for the provided player (don’t forget that we use the 32-bit Steam ID here, not 64-bit). Of course, the matches method does not actually load everything – it has a limit option set to 100 by default, but we override it with our own value. This method accepts some other options, read more here. Next we check if a match with that id was already loaded, and, if not, load its data. Why do we have to call the matches method again, but this time providing the exact match id? The gotcha here is that the first call will return a limited number of fields for performance reasons, so to get the full info we have to query for a specific match. That’s pretty nice, but not very informative. Did the user win the match? What hero did they play? What items did they have? How many kills did they have? It would be great to display this info as well, so let’s proceed to the next step and improve our app further! match_id (integer, index) – Foreign key to establish one-to-many relation. uid (string) – Player’s 32-bit unique id. hero (text) – Player’s hero. This is going to be a serialized attribute storing hero’s id, name and a link to its picture. level (integer) – Hero’s level by the end of the match. kills (integer) – Player’s kills. deaths (integer) – Player’s deaths. assists (integer) – player’s assists. last_hits (integer) – Player’s last hits (how many creeps has they killed). denies (integer) – Player’s denies (how many allied creeps has he denied not allowing enemies receive gold for killing them). gold (integer) – Amount of gold player was having by the end of the match. gpm (integer) – Gold per minute gained. xpm (integer) – Experienced per minute gained. status (string) – Status of the player by the end of the match. They may have stayed till the end of the game, abandoned for some reason, left safely (for example, if poor network connection was detected) or never connected to the game. gold_spent (integer) – Total amount of gold spent during the match by the player. hero_damage (integer) – Total amount of damage dealt to enemy heroes. tower_damage (integer) – Total amount of damage dealt to enemy towers. hero_healing (integer) – Total amount of healing inflicted to allied heroes. items (text) – Serialized attribute containing an array of items that player had by the end of the game. We will store each item’s id, name, and a link to its picture. slot (integer) – Player’s slot in the team (from 1 to 5). radiant (boolean) – This indicates the player’s team. In the simplest scenario, there are only two possibilities (radiant or dire, however it seems that you can be marked as observer), so I’ve used a boolean attribute, but you may use your own method of storing this info. The load_players! method will accept two separate objects with info about Radiant and Dire teams. Each object (radiant and dire) responds to a players method that actually returns an array of players. Much of this method is pretty simple, so I’ll explain the possibly unclear bits. Here we call items on the player object to fetch the items that player had by the end of the match. items returns another object that is an instance of a separate class. This object responds to three main methods: id (item’s id), name (item’s name) and image_url (URL to an item’s picture stored on Dota 2 CDN). Each player has 6 slots to store items. If a slot was empty, the name “Empty” is specified. We don’t really need to save information about empty slots, so simply remove all those elements. After that, generate a hash containing all the info and store it inside the column. Thanks to serialization, later we can fetch this hash and use it normally. The idea here is the same. hero returns a separate object that responds to three main methods: id (hero’s id), name (hero’s name) and image_url (hero’s picture). * :full – full quality horizontal portrait (256x114px, PNG). This is used by default. * :lg – large horizontal portrait (205x11px, PNG). * :sb – small horizontal portrait (59x33px, PNG). I recommend using this one as we need the smallest portrait possible. * :vert – full quality vertical portrait (234x272px, JPEG). Strangely enough this can only be *.jpg*. Load the players, grouping them by team – true for Radiant, false for Dire. By the way, this seems pseudo-philosophical: Radiant are the good, so they are “true” and Dire are bad, chaotic, so they are “false” :). The idea here is that all the pictures returned by Dota 2 API are pretty big, so we just make them smaller. If the player hasn’t stayed till the end of the match, we take note. Great! Now this looks much more informative. However, the user still has no easy way to check if they won a match. Let’s fix this! Just don’t forget to set up the appropriate flush caching conditions. We come to the end of this article. We’ve employed basic Dota 2 API methods and created an app to present a user with basic information about their recent matches. Feel free to expand this demo further and share the results! Working with Dota 2 API is fun and I hoped you liked it, too! Are you interested in seeing the second part on this topic? If so, in the next article I will cover fetching data for live Dota 2 matches. Thank you for reading. Good luck and have fun (as Dota players say)! Another awesome article. Great piece of writing . Hi. You get it when loggin in I suppose?